The Audi A7 four-door luxury coupe is offered with a 340hp, 325 lb-ft 3.0-liter supercharged V6, 7-speed automatic transmission and all-wheel drive. It offers a good blend of performance and economy and more powerful S7 and RS7 versions are also available. Basic specification levels are good although you do pay a premium over the mechanically equivalent A6. Standard features include a premium leather interior and plenty of convenience and safety equipment but do bear in mind that most of the competition are newer and a replacement A7 is around the corner. ‘Four-door coupes’ aren’t anything new to the automotive industry, but it is mildly surprising that a vehicle as relatively novel as the Audi A7 does have a fair bit of competition. 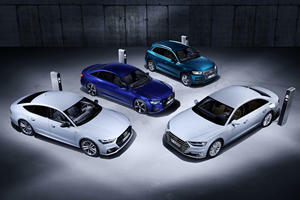 Rivals like the BMW 6 Series Gran Coupe and Mercedes-Benz CLS ensure the Audi A7 doesn’t have this market to itself – and, if you’re willing to expand your horizons to electric cars, the Tesla Model S is also a worthy rival. As a result, the Audi A7 can’t just rest on the laurels of being a more stylish executive car. Thankfully, there is plenty to like about this car beyond the exterior aesthetics: the Audi A7 is comfortable, enjoyable to drive, on top of having a great engine and one of the largest trunks in the class. That’s not to say the Audi A7 is faultless, though. However, despite being one of the older vehicles in this segment, the Audi A7 still does enough right to be worthy of your consideration. The Audi A7 also comes with a crisp infotainment interface that’s also pretty slick and responsive. Audi’s almost renowned in the executive car market for producing some of the best interiors in the business, so it’s no surprise that we like the build quality of the Audi A7’s cabin a lot. What’s perhaps the big shocker here is that it still impresses us despite being one of the oldest executive car interiors on the market right now. For sure, the best-in-class gong currently goes to the Porsche Panamera, but it’s a testament to just how good the Audi A7’s interior was during the car’s launch in 2010 that it still holds up now. Of course, the overall design is betraying the Audi A7’s age, but the overall control layout is fairly intuitive for the most part, with no buttons or rotary knobs on the center console that feel fiddly to use or difficult to operate on the move. Plus, the Audi A7 also comes with a crisp infotainment interface that’s also pretty slick and responsive – if perhaps not quite enough to topple the similar setups in the BMW 6 Series Gran Cabrio, or the touchscreen displays in the Porsche Panamera and Tesla Model S.
The front seats are also comfortable and supportive, offer lots of head and leg room overall and there’s lots of adjustment for the driver in the steering wheel and seat. Overall interior volume up front isn’t too bad. Though the cubby under the center arm rest is awkwardly shaped in order to accommodate the two cup holders in the center console, the glovebox and the front door bins are particularly broad, with the latter being able to swallow up 1.0-liter bottles of water with ease. The front seats are also comfortable and supportive, offer lots of head and leg room overall and there’s lots of adjustment for the driver in the steering wheel and seat. Things do take a bit of a backward step when we enter the back row. Despite the cutouts in the headlining of the roof, there isn’t a huge amount of head room available for taller passengers, and overall leg room whilst better in this regard isn’t class-leading. It’s also worth highlighting the low roofline makes getting in and out a bit tricky (a problem associated with pretty much every ‘four-door coupe’ on the market) and the middle seat in the rear row is on the narrow side – though, in the Audi A7’s defence, some rivals are either dedicated four-seaters only (Porsche Panamera) or offer such limited middle seat room that they’re officially billed as a ‘4+1 seater’ (BMW 6 Series Gran Coupe). Practicality levels do improve once we head towards the trunk. The trunk opening is particularly broad, with the combination of a shallow load lip and a hatchback trunk lid making it particularly easy to use the impressive-by-class-standards 24.5 cubic feet of space with the rear seats in place. The load bay can be extended even further by folding the standard-fit 40:20:40 split-folding rear seat backs completely flat. The Audi A7 is unsurprisingly pretty capable when it comes to the ride/handling balance. Being so heavily based on the Audi A6 sedan, the Audi A7 is unsurprisingly pretty capable when it comes to the ride/handling balance. Though we do concede the Audi A7 isn’t the outright best-in-class in this regard (the BMW 6 Series Gran Coupe and the Porsche Panamera are just as comfortable whilst being that bit more engaging and responsive to drive), the Audi A7 still finds a very much appreciated middle-ground. The ride, for instance, is particularly well composed over rougher surfaces (though, admittedly, fitting 20-inch wheels and the firmer sports suspension does noticeably stiffen things up), and the overall body lean in the bends isn’t prominent either. Having a large windshield and direct, responsive steering also means it’s fairly straightforward to place the Audi A7 where you want it on the open road. Likewise, overall visibility is understandably not great. Where things do start to falter a little bit, however, is with regards to noise refinement. Though wind noise is particularly well suppressed, we are surprised that tire roar is surprisingly obtrusive for a vehicle in this sector of the new car market. It’s by no means bad, but it’s conversely worth pointing out if you’re after a quieter executive car – and also makes the smaller wheels that bit more appealing. Likewise, overall visibility is understandably not great. Whilst the windshield is of a generous size, the chunky pillars and slim rear window aren’t up to those standards. Still, a vast majority of cars in this class do suffer from this predicament as part of their swooping rooflines, and the Audi A7 does rectify this slightly by coming with parking sensors, a reversing camera and a blind spot monitoring system as standard. 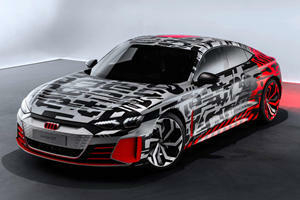 The Audi A7 can only be specified with a 3.0-liter supercharged six-cylinder gasoline engine. Though most rivals do offer more than one engine option, the Audi A7 can only be specified with a 3.0-liter supercharged six-cylinder gasoline engine. Whilst that may be disappointing at first, this restricted powerplant line-up isn’t necessarily a bad thing, as the engine itself is a rather good one. Being supercharged, this six-cylinder is a fairly potent one. With 333-hp and 325 lb-ft on tap, this 3.0-liter unit is on par with what similar engines in competitors like the Mercedes-Benz CLS produce, and the thrust force across the rev range make this supercharged six-cylinder makes it a pretty flexible engine. The Audi A7’s engine’s also very smooth, refined and doesn’t sound or feel coarse when you work it harder, so it’s just at home on a cruise in the slow lane to more liberal excesses of speed. Plus, with claims of 21mpg in the city and 29mpg on the highway, the Audi A7 is quite economical by class standards (not that many people who are spending at least $68,000 on a car will mind about the fuel consumption levels). Going back to the regular Audi A7, the six-cylinder engine can only be specified with a seven-speed automatic transmission. Buyers who are after more power can opt for the top-tier ‘Competition’ trim, which ups the power of the six-cylinder engine to 340-hp. However, as this model starts at $76,550, it isn’t a model we can particularly recommend considering – mainly because the Audi S7 (which has a 450-hp/406 lb-ft 4.0-liter turbocharged eight-cylinder gasoline engine under the hood) can be bought for as little as $79,900. If you’re especially flush with cash, the $110,700 Audi RS7 with a 560-hp/516 lb-ft version of the Audi S7’s engine is also a potential option. Going back to the regular Audi A7, the six-cylinder engine can only be specified with a seven-speed automatic transmission. In true Audi tradition, it’s a very good overall gearbox, thanks to it smooth operation, its responsiveness to manual overrides via the gear selector or the optional paddles behind the steering wheel and its quick gear changes. Like the engine, it’s a very good transmission that, whilst not being amazingly different to what’s offered in rival cars, is still a remarkably well-rounded unit. The Audi A7 does come with a decent amount of equipment as standard. Objectively speaking, the Audi A7 doesn’t really offer that much value for money. Considering the Audi A6 on which it’s based is considerably less expensive to buy, you really need to be in love with the Audi A7’s styling in order to justify the expense. 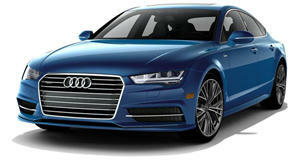 In comparison with its direct rivals, though, the all-wheel-drive-only Audi A7 is surprisingly affordable. With a base price of $68,800, the Audi A7 is noticeably friendlier to your wallet than the BMW 6 Series Gran Coupe ($79,800) and Porsche Panamera ($85,000). In fact, the only competitor that is less expensive to buy initially is the $66,900 Mercedes-Benz CLS – though the Audi A7’s pricing advantage does return if you decide to replace the Mercedes’ rear-wheel drive setup with the optional, $2,500 all-wheel drive system. Likewise, the Audi A7 does come with a decent amount of equipment as standard. All models (including the confusingly-named ‘Premium Plus’ base trim) come with four-zone climate control, built-in navigation, satellite radio, blind spot monitoring and rear parking sensors as standard, which is okay for a car at this price (especially as you’ll be spending a minimum of $70,000 on a Mercedes-Benz CLS if you want to match the entry-level Audi A7’s spec level like-for-like). Official crash test data isn’t available for the Audi A7 currently. Being a premium car, there are admittedly a lot of pricey options available. We’d personally suggest the $350 rear side airbags and the $2,450 Driver Assistance Package (adaptive cruise control, lane departure warning, a pair of cameras in the front bumper that make it easier to see out of blind junctions) are the only extras you’d really need, though we can see the appeal behind the $500 heated steering wheel with paddle shifters and the $4,900 Bang and Olufsen stereo system available on mid-range ‘Prestige’ and top-spec ‘Competition’ models. As we stated earlier, though, ignore the sports suspension, as you’re essentially paying $1,000 to make your Audi A7 less comfortable. Official crash test data isn’t available for the Audi A7 currently, though the performance of the Audi A6 (which was awarded the full five stars in its most recent NHTSA crash test) should mean the Audi A7 will offer more than enough protection should the worst happen. Likewise, the Audi A7 has proven itself to be a fairly reliable vehicle, though the four-years/50,000-miles bumper-to-bumper warranty isn’t as enthralling. Despite being one of the older vehicles in this segment, the Audi A7 remains quite a well-rounded option that’s available to you. The fact it’s considerably more affordable to buy than quite a few of its chief rivals is especially worthy of note, and its combination of a well-built interior, a great engine, a sound ride/handling balance and decent refinement levels only add more strings to this svelte executive car’s prominent bow. Alas, not everything about the Audi A7 is impressive. Buyers who’ll regularly be ferrying about taller passengers in the rear seats will likely be unimpressed with what the Audi A7 offers, as will those who’d ideally like their swoopy four-door car to be as sporty to drive as the exterior styling suggests. However, those blemishes don’t detract too much from what is an otherwise pleasant vehicle. For sure, the Audi A6 it shares so much with is pretty much as good whilst being substantially less expensive to buy, but the Audi A7 is a car we’re strongly suggest you consider if you’re in the market for a ‘four-door coupe’ instead of a regular mid-sized executive sedan. It looks spectacular in the metal.